Christopher Füllemann is a swiss artist born in 1983 in Lausanne. He graduated from Lausanne University of Art and Design / ECAL in 2008 where he studied painting and video art, later focusing his practice in sculpture. In 2012, Füllemann obtained a Master in Fine Arts at San Francisco Art Institute/SFAI and received the SFAI Outstanding Award in Sculpture. He was awarded with the Swiss Art Award 2011 and the Gustave Buchet Prize in 2013, which included a solo show at the Musée Cantonal des Beaux-Arts in Lausanne. Most recently, Füllemann won the Irène Raymond 2016 Award, showed his works during Museumsnacht Basel 2017 and collaborated with the artist Charlotte Herzig and curator Elise Lammer on a series of exhibitions and performances called “Les émotions spatiales”. Furthermore in 2017 Füllemann was part of Zürich Moves! Performance Lab lead by Simone Aughterlony. He is currently working between Zürich and Warsaw on new researches in collaboration with artists, performers, and musicians. 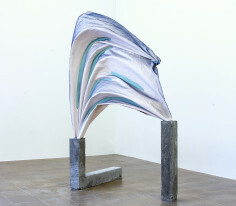 Füllemann’s work is the result of playful sculptural transformations developed as a resistance to normative structures. It questions the function and essence of what is considered “useless” or “unnatural”. His researches are based on the orientation and gestures of the body in relation to objects when diverted from their original function. At the encounter with performance and sculpture, Christopher Füllemann is interested in the experience of forms and materials as living organisms.